As you may already know by now, we're strong advocates for businesses using design to create out-of-the-box solutions to drive growth and competitive advantage in the market. Over and again, companies around the world have proved the potency of using design-centred processes to discover hidden customer needs so they can build their solutions around them. We are starting a new series that is focused to help you to do just that. In this series, we hope to give Nigerian Business Leaders the ammunition they need to meet today’s customer needs, using proven processes from design. Global companies such as Pepsi and Google to name a few, that have benefitted using this process will be proof that your company stands to gain as well. Here’s our first case study in the series, we hope you enjoy it and share with your network. According to Fortune, Fortune 500 companies are hiring chief design officers and investing heavily in design and innovation centres. This week, we’re sharing a notable design-led innovation carried out by PepsiCo (United States) on one of their products, the snack - chips. They found that generally male customers ate chips in a messy way. Pepsi found that when their male customers finished a bag of chips, they poured what’s left into their mouths and rubbed their hands on a chair. Women, however, worrying about how it would stain their clothes were more particular about how they enjoyed the snack. First, they introduced a stacked chip that came in a plastic tray, inside a canister. That way, when a woman wanted to snack, she could do it in a way that was neater and easier for her. The newly created pack also made it easier for her to simply close the pack and put it back when she was done. Secondly, they also made the chip less noisy to eat, because their research showed women usually didn’t like people hearing them crunching away. 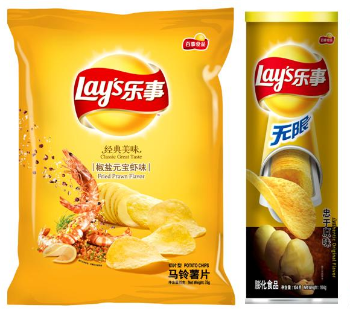 Regular Chips packaging on the left, the easy-to-snack on tray on the right. PepsiCo used Design research (read our article on Design research here) to find out how they could improve their customer’s experience with the Doritos snack. They focused on every part of the experience of eating the chips using design to rethink not only shape, and packaging, but also taste, crunchiness, and usability. As a Business leader in Nigeria today, you must be obsessed with understanding your customers. Especially how they use your product, and how it affects their lives. Is there a product in your portfolio that is proving problematic? Or a service that you are unsure of how it will perform in the market? Using design research to study your customers’ behaviours will shed light on some of their behaviour patterns that you may have missed in the past. These Insights, when discovered could potentially enhance your service or product for optimal customer satisfaction. It’s no secret that people will buy into products and services that not only meet their needs, but that better fit their already existing lifestyles and behaviours and refer them to their loved ones and friends.